Elements of Geometric Computer Vision. © Copyright by Andrea Fusiello. This work is licensed under the Creative Commons Attribution-NonCommercial-ShareAlike License. To view a copy of this license, visit http://creativecommons.org/licenses/by-nc-sa/2.0/deed.en or send a letter to Creative Commons, 559 Nathan Abbott Way, Stanford, California 94305, USA. This notes introduces the basic geometric concepts of multiple-view computer vision. The focus is on geometric models of perspective cameras, and the constraints and properties such models generate when multiple cameras observe the same 3D scene. Geometric vision is an important and well-studied part of computer vision. A wealth of useful results has been achieved in the last 15 years and has been reported in comprehensive monographies, e.g., [4, 12, 6], a sign of maturity for a research subject. It is worth reminding the reader that geometry is an important but not the only important aspect of computer vision, and in particular of multi-view vision. The information brought by each image pixel is twofold: its position and its colour (or brightness, for a monochrome image). Ultimately, each computer vision system must start with brightness values, and, to smaller or greater depth, link such values to the 3D world. Figure 1: Example of reconstruction from images. Original images (top row) and reconstructed model (bottom row). The ambient space is modellled as a projective 3-D space 3, obtained by completing the affine space 3 with a projective plane, known as plane at infinity . In this ideal plane lie the intersections of the planes parallel in X3. where indicates equality to within a multiplicative factor. is defined by its equation t = 0. The points of the affine space are those of 3 which do not belong to . Their projective coordinates are thus of the form (x,y,z, 1), where (x,y,z) are the usual affine coordinates. The linear transformations of a projective space into itself are called collineations or homographies. Any collineation of 3 is represented by a generic 4 � 4 invertible matrix. Affine transformations of 3 are the subgroup of collineations of 3 that preserves the plane at infinity. The stratification reflects the amount of knowledge that we possess about the scene and the sensor. The pin-hole camera is described by its optical centre C (also known as camera projection centre) and the image plane. The distance of the image plane from C is the focal length f.
The line from the camera centre perpendicular to the image plane is called the principal axis or optical axis of the camera. The plane parallel to the image plane containing the optical centre is called the principal plane or focal plane of the camera. The relationship between the 3D coordinates of a scene point and the coordinates of its projection onto the image plane is described by the central or perspective projection. Figure 2: Pin-hole camera geometry. 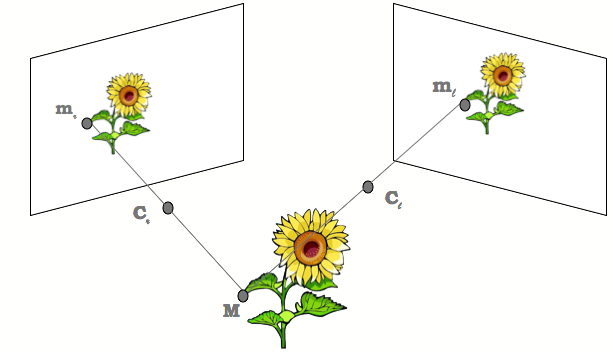 The left figure illustrates the projection of the point M on the image plane by drawing the line through the camera centre C and the point to be projected. The right figure illustrates the same situation in the YZ plane, showing the similar triangles used to compute the position of the projected point m in the image plane. A 3D point is projected onto the image plane with the line containing the point and the optical centre (see Figure 2). Let the centre of projection be the origin of a Euclidean coordinate system wherein the z-axis is the principal axis. By similar triangles it is readily seen that the 3D point (x,y,z)T is mapped to the point (fx/z,fy/z)T on the image plane. The matrix describing the mapping is called the camera projection matrix P.
where M = (x,y,z, 1)T are the homogeneous coordinates of the 3D point and m = (fx/z,fy/z, 1)T are the homogeneous coordinates of the image point. The projection matrix P in Equation (3) represents the simplest possible case, as it only contains information about the focal distance f.
General camera: bottom up approach The above formulation assumes a special choice of world coordinate system and image coordinate system. It can be generalized by introducing suitable changes of the coordinates systems. G is composed by a rotation matrix R and a translation vector t. It describes the position and orientation of the camera with respect to an external (world) coordinate system. It depends on six parameters, called external parameters. The rows of R are unit vectors that, together with the optical centre, define the camera reference frame, expressed in world coordinates. K is the camera calibration matrix; it encodes the transformation from image coordinates to pixel coordinates in the image plane. angle between the axes (usually /2). The ratio sy/sx is the aspect ratio (usually close to 1). 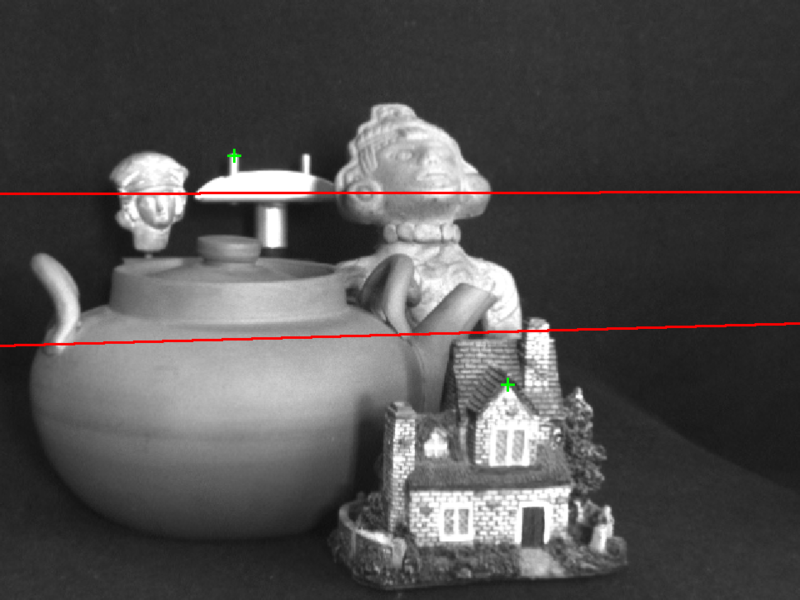 where is the distance of M from the focal plane of the camera (this will be shown after), and m = (u,v, 1)T .
Note that, except for a very special choice of the world reference frame, this “depth” does not coincide with the third coordinate of M.
General camera: top down approach If P describes a camera, also P for any 0 /= describes the same camera, since these give the same image point for each scene point. In general, the camera projection matrix is a 3 � 4 full-rank matrix and, being homogeneous, it has 11 degrees of freedom. ( is defined because K(3, 3) = 1). where is a three-vector containing the affine (non-homogeneous) coordinates of the optical centre. where the matrix P is represented by the block form: P = [P3�3|p4] (P3�3 is the matrix composed by the first three rows and first three columns of P, and p4 is the fourth column of P). A few words about normalization If = 1 in Eq. (10), the matrix P is said to be normalized. If (and only if) the matrix is normalized, then in the projection equation (8) is the distance of M from the focal plane of the camera (usually referred to as depth). In particular, the third component is = p3T ( - ), where p 3T is the third row of P3�3. If write R in terms of its rows and multiply in Eq. (7) we see that p3T is the third row of R, which correspond to the versor of the principal axis. Hence, the previous equations says that is the projection of the vector ( - ) onto the principal axis, i.e., the depth of M.
In general (when the camera is not normalized), contains an arbitrary scale factor. Can we recover this scale factor from a generic camera matrix P without factorizing it like in Eq. (10)? We only need to observe that if P is given by Eq. (10), p3T is the third row of R multiplied by the scale factor . Hence, = ||p3||. Optical ray The projection can be geometrically modelled by a ray through the optical centre and the point in space that is being projected onto the image plane (see Fig. 2). The optical ray of an image point m is the locus of points in space that projects onto m.
Please note that, provided that P is normalized, the parameter in the equation of the optical ray correspond to the depth of the point M.
We will prove now that the image of the absolute conic depends on the intrinsic parameters only (it is unaffected by camera position and orientation). The image of points on the plane at infinity does not depend on camera position (it is unaffected by camera translation). The conic = (KK-T )-1 is the image of the absolute conic. The angle (a metrical property) between two rays is determined by the image of the absolute conic. Figure 3: Measuring the angle between two rays. Although there are three equations, only two of them are linearly independent: we can write the third row (e.g.) as a linear combination of the first two. From a set of n point correspondences, we obtain a 2n � 12 coefficient matrix A by stacking up two equations for each correspondence. In general A will have rank 11 (provided that the points are not all coplanar) and the solution is the 1-dimensional right null-space of A. The projection matrix P is computed by solving the resulting linear system of equations, for n > 6. If the data are not exact (noise is generally present) the rank of A will be 12 and a least-squares solution is sought. The least-squares solution for vec PT is the singular vector corresponding to the smallest singular value of A. This is called the Direct Linear Transform (DLT) algorithm . The two-view geometry is the intrinsic geometry of two different perspective views of the same 3D scene (see Figure 4). It is usually referred to as epipolar geometry. The two perspective views may be acquired simultaneously, for example in a stereo rig, or sequentially, for example by a moving camera. From the geometric viewpoint, the two situations are equivalent, but notice that the scene might change between successive snapshots. 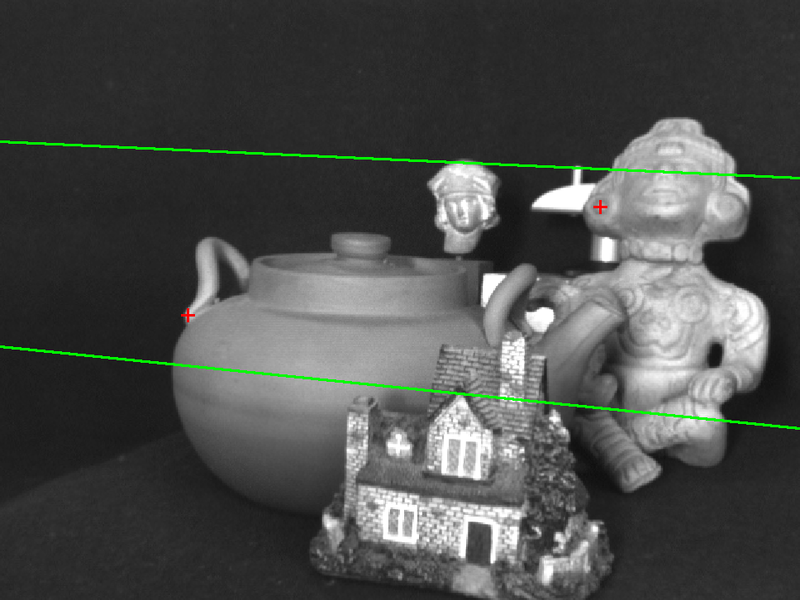 Most 3D scene points must be visible in both views simultaneously. This is not true in case of occlusions, i.e., points visible only in one camera. Any unoccluded 3D scene point M = (x,y,z, 1)T is projected to the left and right view as m = (u ,v , 1)T and m r = (ur,vr, 1)T , respectively (see Figure 4). Image points m and mr are called corresponding points (or conjugate points) as they represent projections of the same 3D scene point M.
The knowledge of image correspondences enables scene reconstruction from images. Figure 4: Two perspective views of the same 3D scene. m and mr are corresponding points, as they are the projection of the same 3D point, M.
Geometrically, the position of the image point m in the left image plane I can be found by drawing the optical ray through the left camera projection centre C and the scene point M. The ray intersects the left image plane I at m . Similarly, the optical ray connecting Cr and M intersects the right image plane Ir at mr. The relationship between image points m and mr is given by the epipolar geometry, described in Section 4.1. The epipolar geometry describes the geometric relationship between two perspective views of the same 3D scene. 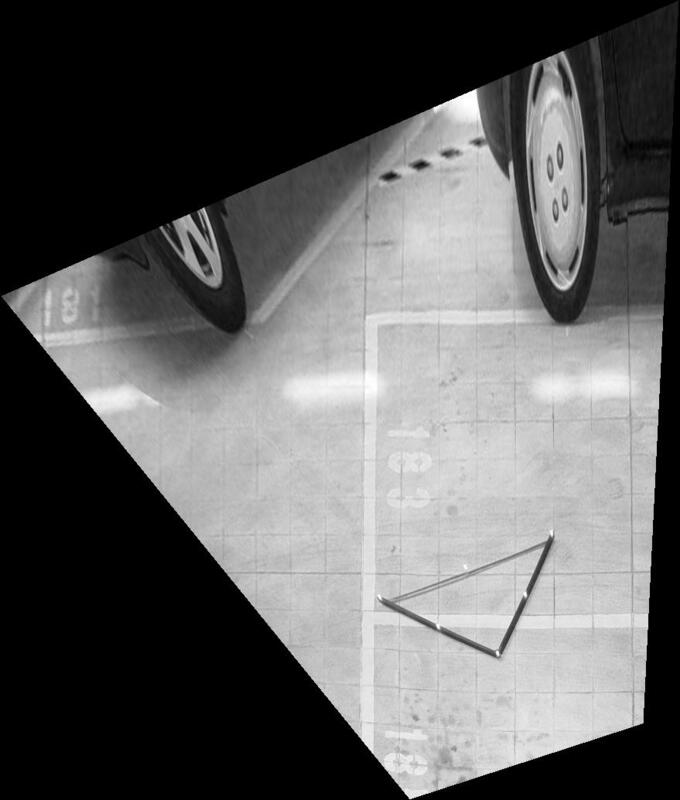 The key finding, discussed below, is that corresponding image points must lie on particular image lines, which can be computed without information on the calibration of the cameras. This implies that, given a point in one image, one can search the corresponding point in the other along a line and not in a 2D region, a significant reduction in complexity. Figure 5: The epipolar geometry and epipolar constraint. Any 3D point M and the camera projection centres C and Cr define a plane that is called epipolar plane. The projections of the point M, image points m and mr, also lie in the epipolar plane since they lie on the rays connecting the corresponding camera projection centre and point M.
The conjugate epipolar lines, l and lr, are the intersections of the epipolar plane with the image planes. The line connecting the camera projection centres (C ,Cr) is called the baseline. The baseline intersects each image plane in a point called epipole. By construction, the left epipole e is the image of the right camera projection centre Cr in the left image plane. Similarly, the right epipole er is the image of the left camera projection centre C in the right image plane. All epipolar lines in the left image go through e and all epipolar lines in the right image go through er. The epipolar constraint. An epipolar plane is completely defined by the camera projection centres and one image point. Therefore, given a point m , one can determine the epipolar line in the right image on which the corresponding point, mr, must lie. This is the equation of a line through the right epipole er and the image point m ' = P3�3,rP3�3,l-1m which represents the projection onto the right image plane of the point at infinity of the optical ray of m .
The equation for the left epipolar line is obtained in a similar way. Figure 6: Left and right images with epipolar lines. The epipolar geometry can be described analytically in several ways, depending on the amount of the a priori knowledge about the stereo system. We can identify three general cases. If both intrinsic and extrinsic camera parameters are known, we can describe the epipolar geometry in terms of the projection matrices (Equation (24)). If only the intrinsic parameters are known, we work in normalised coordinates and the epipolar geometry is described by the essential matrix. If neither intrinsic nor extrinsic parameters are known the epipolar geometry is described by the fundamental matrix. If the intrinsic parameters are known, we can switch to normalised coordinates: m K-1m (please note that this change of notation will hold throughout this section). With this choice, the unknown extrinsic parameters have been made explicit. as the homogeneous line through two points is expressed as their cross product. Similarly, a dot product of a point and a line is zero if the point lies on the line. E encodes only information on the extrinsic camera parameters. It is singular, since det[t]� = 0. The essential matrix is a homogeneous quantity. It has only five degrees of freedom: a 3D rotation and a 3D translation direction. is the fundamental matrix F, giving the relationship between the corresponding image points in pixel coordinates. F is the algebraic representation of the epipolar geometry. It is a 3 � 3, rank-two homogeneous matrix. It has only seven degrees of freedom since it is defined up to a scale and its determinant is zero. Notice that F is completely defined by pixel correspondences only (the intrinsic parameters are not needed). This is another way of writing the epipolar constraint: the epipolar line of mr (FT m r) is the line containing its corresponding point (m ) and the epipole in the left image (e ). If a number of point correspondences m i m ri is given, we can use Equation (35) to compute the unknown matrix F.
Each point correspondence gives rise to one linear equation in the unknown entries of F. From a set of n point correspondences, we obtain a n � 9 coefficient matrix A by stacking up one equation for each correspondence. In general A will have rank 8 and the solution is the 1-dimensional right null-space of A. The fundamental matrix F is computed by solving the resulting linear system of equations, for n > 8. If the data are not exact and more than 8 points are used, the rank of A will be 9 and a least-squares solution is sought. The least-squares solution for vec F is the singular vector corresponding to the smallest singular value of A. This method does not explicitly enforce F to be singular, so it must be done a posteriori. Replace F by F' such that det F' = 0, by forcing to zero the least singular value. It can be shown that F' is the closest singular matrix to F in Frobenius norm. Geometrically, the singularity constraint ensures that the epipolar lines meet in a common epipole. Given the camera matrices P and Pr, let m and mr be two corresponding points satisfying the epipolar constraint mrT Fm = 0. It follows that mr lies on the epipolar line Fm and so the two rays back-projected from image points m and mr lie in a common epipolar plane. Since they lie in the same plane, they will intersect at some point. This point is the reconstructed 3D scene point M.
The depth r and are unknown. Both encode the position of M in space, as r is the depth of M wrt the right camera and is the depth of M wrt the left camera. The reconstructed point M can then be calculated by inserting the value into Equation (14). In reality, camera parameters and image locations are known only approximately. The back-projected rays therefore do not actually intersect in space. It can be shown, however, that Formula (43) solve Eq. (42) in a least squares sense . Triangulation is addressed in more details in [2, 15, 12, 51]. When observing a plane, we obtain an interesting specialization of the epipolar geometry of two views. First, let us establish that the map between a world plane and its perspective image is a collineation of 2. The easiest way to see it is to choose the world coordinate system such that the plane has equation z = 0. Points are mapped from the world plane to the image plane with a 3 � 3 non-singular matrix, which represents a collineation of 2. Figure 7: The map between a world plane and a perspective image is a collineation. Next, we prove that: images of points on a plane are related to corresponding image points in a second view by a collineation (or homography) of 2. We have one collineation from to the left image plane, and another collineation from to the right image plane. By composing the inverse of the first with the second, we define a collineation from the image plane of the left camera to the image plane of the right camera. where H is a 3 � 3 non-singular matrix. and this imposes six homogeneous constraints on H .
A collineation H that satisfies Eq. (47) is said to be compatible with F.
This is a three-parameter family of collineations, parameterized by n/d. The infinite homography H is the collineation induced by the plane at infinity; it maps vanishing points to vanishing points (a vanishing point is where all the lines that shares the same direction meet). The infinity homography does not depend on the translation between views. Note that H can be obtained if t = 0 in Eq. (32), which corresponds to a rotation about the camera centre. Thus H not only relates points at infinity when the camera describes a general motion, but it also relates image points of any depth if the camera rotates about its centre. In general, when points are not on the plane, the homography induced by a plane generates a virtual parallax. This gives rise to an alternative representation of the epipolar geometry and scene structure . can be seen as composed by a transfer with the infinity homography (H m ) plus a parallax correction term ( er). Figure 8: Plane induced parallax. with = , where a is the distance of M to the plane . When M is on the 3D plane , then mr H m . Otherwise there is a residual displacement, called parallax, which is proportional to and oriented along the epipolar line. The magnitude parallax depends only on the left view and the plane. It does not depend on the parameters of the right view. Figure 9: Left and right images. The leftmost image is a superposition of the warped left image and the right image. The reference plane exactly coincide. However, points off the plane (such as the bottle) do not coincide. From a set of n point correspondences, we obtain a 2n� 9 coefficient matrix A by stacking up two equations for each correspondence. The projection matrix H is computed by solving the resulting linear system of equations, for n > 4. If the data are not exact, and more than 4 points are used, the rank of A will be 9 and a least-squares solution is sought. The least-squares solution for vec HT is the singular vector corresponding to the smallest singular value of A. This is another incarnation of the DLT algorithm. The epipole can be located  given the homography H between two views and two off-plane conjugate pairs m 0 m r0 and m 1 m r1 . In the projective plane, the line determined by two points is given by their cross product, as well as the point determined by two lines. Please note that the epipole and the homography can be computed from images only up to an unknown scale factor. It follows that the magnitude of the parallax as well is known only up to a scale factor. Mosaics. Image mosaicing is the automatic alignment (or registration) of multiple images into larger aggregates . There are two types of mosaics. In both cases, it turns out that images are related by homographies, as we discussed previously. result from the registration of different views of a planar scene. result from the registration of views taken by a camera rotating around its optical centre (typ. panning). In some cases, in order to cope with large rotations (> 180 deg), the images are converted to cylindrical coordinates. Figure 10: Planar mosaic with components location shown as white outlines. Figure 11: Selected frames from “Arena” sequence (top) and panoramic mosaic (bottom). Components location shown as white outlines. Orthogonal rectification. The map between a world plane and its perspective image is an homography. The world-plane to image-plane homography is fully defined by four points of which we know the relative position in the world plane. Once this homography is determined, the image can be back projected (warped) onto the world plane. This is equivalent to synthesize an image as taken from a fronto-parallel view of the plane. This is known as orthogonal rectification  of a perspective image. What can be reconstructed depends on what is known about the scene and the stereo system. We can identify three cases. If both the intrinsic and extrinsic camera parameters are known, we can solve the reconstruction problem unambiguously by triangulation. If only the intrinsic parameters are known, we can estimate the extrinsic parameters and solve the reconstruction problem up to an unknown scale factor. In other words, R can be estimated completely, and t up to a scale factor. If neither intrinsic nor extrinsic parameters are known, i.e., the only information available are pixel correspondences, we can still solve the reconstruction problem but only up to an unknown, global projective transformation of the world. If only intrinsics are known (plus point correspondences between images), the epipolar geometry is described by the essential matrix (Section 4.1.1). We will see that, starting from the essential matrix, only a reconstruction up to a similarity transformation (rigid+ uniform scale) can be achieved. Such a reconstruction is referred to as “Euclidean”. Unlike the fundamental matrix, the only property of which is to have rank two, the essential matrix is characterised by the following theorem . Theorem 4.1 A real 3 � 3 matrix E can be factorised as product of a nonzero skew-symmetric matrix and a rotation matrix if and only if E has two identical singular values and a zero singular value. The theorem has a constructive proof (see ) that describes how E can be factorised into rotation and translation using its Singular Value Decomposition (SVD). The rotation R and translation t are then used to instantiate a camera pair as in Equation (25), and this camera pair is subsequently used to reconstruct the structure of the scene by triangulation. The rigid displacement ambiguity arises from the arbitrary choice of the world reference frame, whereas the scale ambiguity derives from the fact that t can be scaled arbitrarily in Equation (29) and one would get the same essential matrix (E is defined up to a scale factor). Therefore translation can be recovered from E only up to an unknown scale factor which is inherited by the reconstruction. This is also known as depth-speed ambiguity. Suppose that a set of image correspondences m i m ri are given. It is assumed that these correspondences come from a set of 3D points Mi, which are unknown. Similarly, the position, orientation and calibration of the cameras are not known. This situation is usually referred to as weak calibration, and we will see that the scene may be reconstructed up to a projective ambiguity, which may be reduced if additional information is supplied on the cameras or the scene. If T is any 4 � 4 invertible matrix, representing a collineation of 3, then replacing points Mi by TMi and matrices P and Pr by P T-1 and P rT-1 does not change the image points m i. This shows that, if nothing is known but the image points, the structure Mi and the cameras can be determined only up to a projective transformation. can be created in such a way that they yield the fundamental matrix F, as can be easily verified. The position in space of the points Mi is then obtained by triangulation. The only difference with the previous case is that F does not admit a unique factorization, whence the projective ambiguity follows. Indeed, for any A satisfying Equation (64), also A + erxT for any vector x, satisfies Equation (64). One matrix A satisfying Equation (64) can be obtained as A = -[er]�F (this is called the epipolar projection matrix ). More in general, any homography induced by a plane can be taken as the A matrix (cfr. Eq. (48)). In this section we study the relationship that links three or more views of the same 3D scene, known in the three-view case as trifocal geometry. This geometry can be described in terms of fundamental matrices linking pairs of cameras, but in the three-view case a more compact and elegant description is provided by a special algebraic operator, the trifocal tensor. We also discover that three views are all we need, in the sense that additional views do not allow us to compute anything we could not already compute (Section 5.4). Denoting the cameras by 1, 2, 3, there are now three fundamental matrices, F1,2, F1,3, F2,3, and six epipoles, ei,j, as in Figure 13. The three fundamental matrices describe completely the trifocal geometry . The plane containing the three optical centres is called the trifocal plane. It intersects each image plane along a line which contains the two epipoles. Three fundamental matrices include 21 free parameters, less the 3 constraints above; the trifocal geometry is therefore determined by 18 parameters. This description of the trifocal geometry fails when the three cameras are collinear, and the trifocal plane reduces to a line. Point transfer If the trifocal geometry is known, given two conjugate points m1 and m2 in view 1 and 2 respectively, the position of the conjugate point m3 in view 3 is completely determined (Figure 14). Figure 14: Point transfer using epipolar constraints between three views. View synthesis [27, 1, 3], exploit the trifocal geometry to generate novel (synthetic) images starting from two reference views. A related topic is image-based rendering [28, 52, 24]. if the three cameras centres are collinear (independently of the position of 3D point). These deficiencies motivate the introduction of an independent trifocal constraint. This is the fundamental trifocal constraint, that links (via a trilinear equation) m1, s2 (any line through m2) and s3 (any line through m3). Geometrically, the trifocal constraint imposes that the optical rays of m1 intersect the 3D line L that projects onto s2 in the second image and s3 in the third image. The trifocal constraint represents the trifocal geometry (nearly) without singularities. It only fails is when the cameras are collinear and the 3D point is on the same line. Figure 15: Two arbitrary lines s2 and s3 through corresponding points m2 and m3 in the second and third image respectively, define a 3D line L that must intersect the optical ray of m1. We can write this trilinear form (Eq. (74)) as2: where T is the 9 � 3 matrix defined by which represent the trilinear form, in the sense that contains its 27 coefficient. where (Tm1)(3) is a 3 � 3 matrix such that vec(Tm 1)(3) = Tm 1. This equation can be used to recover T (likewise we did for F). The coefficient matrix is a 9 � 27 matrix of rank 4 (the rank of the Kronecker product is the product of the ranks), therefore every triplet (m1, m2, m3) of corresponding points gives four linear independent equations. Seven triplets determine the 27 entries of T.
This point transfer equation was derived by . In this section we followed the approach of [39, 32] to avoid the tensorial notation. In the next slide, however, we will briefly sketch the tensorial interpretation of the trifocal constraint. A starting point to learn more on the trifocal tensor is . The trifocal tensor. The trifocal tensor T is a a 3 � 3 � 3 array, which can be seen as a stack of three 3 � 3 matrices. The entries of T are those of the matrix T (just rearranged). Therefore, the action of the tensor T (m1,s2,s3) = s2T (Tm 1)(3)s 3 is to first combine matrices of the stack according to m1, then combine the columns according to s3 and finally to combine the elements according to s2. As in the case of two views, what can be reconstructed depends on what is known about the scene and the cameras. If the internal parameters of the cameras are known, we can obtain a Euclidean reconstruction, that differs from the true reconstruction by a similarity transformation. This is composed by a rigid displacement (due to the arbitrary choice of the world reference frame) plus a a uniform change of scale (due to the well-known depth-speed ambiguity). In the weakly calibrated case, i.e., when point correspondences are the only information available, a projective reconstruction can be obtained. In both cases, the solution is not straightforward generalization of the two view case, as the problem of global consistency comes into play (i.e., how to relate each other the local reconstructions that can be obtained from view pairs). Let us consider for simplicity the case of three views, which generalizes straightforward to N views. If one applies the method of Section 4.4.1 to view pairs 1-2, 1-3 and 2-3 one obtains three displacements (R12, 12), (R13, 13) and (R23, 23) known up a scale factor, as the norm of translation cannot be recovered, (the symbol^indicates a unit vector). where 1 = ||t12||/||t13|| and 2 = ||t23||/||t13|| are unknown. In this way three consistent camera matrices can be instantiated. Note that only ratios of translation norm can be computed, hence the global scale factor remains undetermined. If one applies the method of Section 4.4.2 to consecutive pairs of views, she would obtain, in general, a set of reconstructions linked to each other by an unknown projective transformation (because each camera pair defines its own projective frame). An elegant method for multi-image reconstruction was described in , based on the same idea of the factorization method . In this formula the mij are known, but all the other quantities are unknown, including the projective depths ij. Equation (84) tells us that W can be factored into the product of a 3m� 4 matrix P and a 4 �n matrix S. This also means that W has rank four. For any non singular projective transformation T, TP and T-1S is an equally valid factorization of the data into projective motion and structure. As expected, the reconstruction is up to an unknown projective transformation. A consequence of this is that the choice of attaching the diagonal matrix to U3m�4 is arbitrary. It could be attached to V n�4 or even factorized in two matrices. As the i,j are unknown, we are left with the problem of estimating them. The original algorithm  uses the epipolar constraint (Eq.41) to fix the ratio of the projective depths of one point in successive images. It can be proven that the quantity that is being minimized is 5. This technique is fast, requires no initialization, and gives good results in practice, although there is no guarantee that the iterative process will converge. A provably convergent iterative method have been presented in . This implies that the 3m � (m + 4) matrix (let us call it L) is rank-deficient, i.e., rank L < m + 4. In other words, all the (m + 4) � (m + 4) minors of L are equal to 0. It has been proven that there are three different types of such minors that translates into meaningful multi-view constraints, depending on the number of rows taken from each view. Two rows from one view and two rows from another view. This gives a bilinear two-view constraint, expressed by the bifocal tensor i.e., the fundamental matrix. Two rows from one view, one row from another view and one row from a third view. This gives a trilinear three-view constraint, expressed by the trifocal tensor. One row from each of four different views. This gives a quadrilinear four-view constraint, expressed by the quadrifocal tensor. All the other type of minors can be factorised as product of the two-, three-, or four-views constraints and point coordinates in the images3. The aim of autocalibration is to compute the internal parameters, starting from weakly calibrated cameras. More in general, the task is to recover metric properties of camera and/or scene, i.e., to compute a Euclidean reconstruction. Direct: solve directly for the internal parameters. Stratified: first obtain a projective reconstruction and then transform it to a Euclidean reconstruction (in some cases an affine reconstruction is obtained in between). The reader is referred to  for a review of autocalibration, and to [35, 49, 21, 40, 37, 11] for classical and recent work on the subject. Consider m cameras. The difference between the d.o.f. of the multifocal geometry (e.g. 7 for two views) and the d.o.f. of the rigid displacements (e.g. 5 for two views) is the number of independent constraints available for the computation of the intrinsic parameters (e.g. 2 for two views). The multifocal geometry of m cameras (represented by the m-focal tensor) has 11m- 15 d.o.f. Proof: a set of m cameras have 11m d.o.f., but they determine the m-focal geometry up to a collineation of 3, which has 15 d.o.f. The net sum is 11m - 15 d.o.f. On the other hand, the rigid displacements in m views are described by 6m - 7 parameters: 3(m - 1) for rotations, 2(m - 1) for translations, and m - 2 ratios of translation norms. Thus, m weakly calibrated views give 5m - 8 constraints available for computing the intrinsic parameters. Let us suppose that mk parameters are known and mc parameters are constant. The first view introduces 5 - mk unknowns. Every view but the first introduces 5 - mk - mc unknowns. For example, if the intrinsic parameters are constant, three views are sufficient to recover them. If one parameter (usually the skew) is known and the other parameters are varying, at least eight views are needed. If we consider two views, two independent constraints are available for the computation of the intrinsic parameters from the fundamental matrix. Indeed, F has 7 d.o.f, whereas E, which encode the rigid displacement, has only 5 d.o.f. There must be two additional constraint that E must satisfy, with respect to F.
In particular, these constraints stem from the equality of two singular values of the essential matrix (Theorem 4.1) which can be decomposed in two independent polynomial equations. Let Fij be the (known) fundamental matrix relating views i and j, and let Ki and Kj be the respective (unknown) intrinsic parameter matrices. satisfies the constraints of Theorem 4.1 only if the intrinsic parameters are correct. where 1 ij > 2 ij are the non zero singular values of Eij and wij are normalized weight factors (linked to the reliability of the fundamental matrix estimate). The previous counting argument shows that, in the general case of n views, the n(n - 1)/2 two-view constraints that can be derived are not independent, nevertheless they can be used as they over-determine the solution. A non-linear least squares solution is obtained with an iterative algorithm (e.g. Gauss-Newton) that uses analytical derivatives of the cost function. A starting guess is needed, but this cost function is less affected than others by local minima problems. A globally convergent algorithm based on this cost function is described in . We have seen that a projective reconstruction can be computed starting from points correspondences only (weak calibration), without any knowledge of the camera matrices. Projective reconstruction differs from Euclidean by an unknown projective transformation in the 3-D projective space, which can be seen as a suitable change of basis. Starting from a projective reconstruction the problem is computing the transformation that “straighten” it, i.e., that upgrades it to an Euclidean reconstruction. To this purpose the problem is stratified [31, 5] into different representations: depending on the amount of information and the constraints available, it can be analyzed at a projective, affine, or Euclidean level. where rT is a 3-vector and s is a scale factor, which we will arbitrarily set to 1 (the Euclidean reconstruction is up to a scale factor). Under this parameterization T is clearly non singular, and it depends on eight parameters. This is the basic equation for autocalibration (called absolute quadric constraint), relating the unknowns Ki (i = 0...m) and r to the available data Pi (obtained from weakly calibrated images). Note that (101) contains five equations, because the matrices of both members are symmetric, and the homogeneity reduces the number of equations with one. where C* is the dual conic and Q* is the dual quadric. An expression with Q and C may be derived, but it is quite complicated. C* (resp. Q*) is the adjoint matrix of C (resp. Q). If C is non singular, then C* = C-1. In the beginning we introduced the absolute conic , which is invariant under similarity transformation, hence deeply linked with the Euclidean stratum. In a Euclidean frame, its equation is x12 + x 22 + x 32 = 0 = x 4. Autocalibration requires to solve Eq. (107), with respect to * (and i*). If * is known, the collineation T that upgrades cameras from projective to Euclidean is obtained by decomposing * as in Eq. (105), using the eigenvalue decomposition. * might be parameterized as in Eq. (106) with 8 d.o.f. or parameterized as a generic 4 � 4 symmetric matrix (10 d.o.f.). The latter is an over-parameterization, as * is also singular and defined up to a scale factor (which gives again 8 d.o.f.). There are several strategies for dealing with the scale factor. This gives 6 equations but introduces one additional unknown (the net sum is 5). Eliminate it by using the same idea of the cross product for 3-vectors : which is tantamount to say that every 2 � 2 minor of [vec i*| vec(P i *P iT )] is zero. As matrices in Eq. (107) are symmetric, only 6 elements need to be considered in the corresponding vectors. There are 15 different order-2 minors of a 6 � 2 matrix, but only 5 equations are independent. In any case, a non-linear least-squares problem has to be solved. Available numerical techniques (based on the Gauss-Newton method) are iterative, and requires an estimate of the solution to start. This can be obtained by doing an educated guess about skew, principal point and aspect ratio, and solve the linear problem that results. Linear solution If some of the internal parameters are known, this might cause some elements of i* to vanish. Linear equations on * are generated from zero-entries of * (because this eliminates the scale factor): where pi,kT is the k-th row of P i. Likewise, linear constraints on * can be obtained from the equality of elements in the the upper (lower) triangular part of i* (because i* is symmetric). In order to be able to solve linearly for *, at least 10 linear equations must be stacked up, to form a homogeneous linear system, which can be solved as usual (via SVD). Singularity of * can be enforced a-posteriori by forcing the smallest singular value to zero. If the principal point is known, i*(1, 3) = 0 = i*(2, 3) and this gives two linear constraints. If, in addition, skew is zero we have i*(1, 2) = 0. Known aspect ratio r provides a further constraint: r i*(1, 1) = i*(2, 2). The constraints expressed by Eq. (110) are called the Kruppa constraints in . Since each camera matrix, apart from the first one, gives five equations in the eight unknowns, a unique solution is obtained when at least three views are available. The resulting system of equations is solved with a non-linear least-squares technique (e.g. Gauss-Newton). In this section we will approach estimation problems from a more “practical” point of view. First, we will discuss how the presence of errors in the data affects our estimates and describe the countermeasures that must be taken to obtain a good estimate. Second, we will introduce non-linear distortions due to lenses into the pinhole model and we illustrate a practical calibration algorithm that works with a simple planar object. Finally, we will describe rectification, a trasformation of image pairs such that conjugate epipolar lines become collinear and parallel to one of the image axes, usually the horizontal one. In such a way, the correspondence search is reduced to a 1D search along the trivially identified scanline. In presence of noise (or errors) on input data, the accuracy of the solution of a linear system depends crucially on the condition number of the system. The lower the condition number, the less the input error gets amplified (the system is more stable). As  pointed out, it is crucial for linear algorithms (as the DLT algorithm) that input data is properly pre-conditioned, by a suitable coordinate change (origin and scale): points are translated so that their centroid is at the origin and are scaled so that their average distance from the origin is . This improves the condition number of the linear system that is being solved. Apart from improved accuracy, this procedure also provides invariance under similarity transformations in the image plane. Measured data (i.e., image or world point positions) is noisy. Usually, to counteract the effect of noise, we use more equations than necessary and solve with least-squares. What is actually being minimized by least squares? In a typical null-space problem formulation Ax = 0 (like the DLT algorithm) the quantity that is being minimized is the square of the residual ||Ax||. In general, if ||Ax|| can be regarded as a distance between the geometrical entities involved (points, lines, planes, etc..), than what is being minimized is a geometric error, otherwise (when the error lacks a good geometrical interpretation) it is called an algebraic error. All the linear algorithm (DLT and others) we have seen so far minimize an algebraic error. Actually, there is no justification in minimizing an algebraic error apart from the ease of implementation, as it results in a linear problem. Usually, the minimization of a geometric error is a non-linear problem, that admit only iterative solutions and requires a starting point. Often linear solution based on algebraic residuals are used as a starting point for a non-linear minimization of a geometric cost function, which gives the solution a final “polish” . where d() is the Euclidean distance between the homogeneous points. The goal is to estimate the 3D coordinates of a point M, given its projection mi and the camera matrix Pi for every view i = 1...m.
The DLT solution is used as a starting point for the iterative minimization (e.g. Gauss-Newton). The goal is to estimate F given a a number of point correspondences m i m ri. where d() here is the Euclidean distance between a line and a point (in homogeneous coordinates). The eight-point solution is used as a starting point for the iterative minimization (e.g. Gauss-Newton). Note that F must be suitably parameterized, as it has only seven d.o.f. The goal is to estimate H given a a number of point correspondences m i m ri. where d() is the Euclidean distance between the homogeneous points. This also called the symmetric transfer error. If measurements are noisy, the projection equation will not be satisfied exactly by the camera matrices and structure computed in Sec. 5.3.2. As m and n increase, this becomes a very large minimization problem. A solution is to alternate minimizing the re-projection error by varying i with minimizing the re-projection error by varying j.
where i = i[ i| i] and the rotation has to be suitably parameterized parameterized with three parameters (see Rodrigues formula). See  for a review and a more detailed discussion on bundle adjustment. Up to this point, we have assumed that the only source of error affecting correspondences is in the measurements of point’s position. This is a small-scale noise that gets averaged out with least-squares. In practice, we can be presented with mismatched points, which are outliers to the noise distribution (i.e., wrong measurements following a different, unmodelled, distribution). Figure 16: A single outlier can severely offset the least-squares estimate (red line), whereas the robust estimate (blue line) is unaffected. The goal of robust estimation is to be insensitive to outliers (or at least to reduce sensitivity). is a symmetric function with a unique minimum at zero that grows sub-quadratically, called loss function. The M-estimate is obtained by solving this system of non-linear equations. Determine the set Si of data points that are within an error tolerance t of the model. Si is the consensus set of the sample. If the size of Si is greater than a threshold T, re-estimate the model (possibly using least-squares) using Si (the set of inliers) and terminate. If the size of Si is less than T, repeat from step 1. Terminate after N trials and choose the largest consensus set found so far. Three parameters need to be specified: t,T and N.
Both T and N are linked to the (unknown) fraction of outliers . By requiring that P must be near 1, N can be solved for given values of p and . T should be equal to the expected number of inliers, which is given (in fraction) by (1 - ). At each iteration, the largest consensus set found so fare gives a lower bound on the fraction of inliers, or, equivalently, an upper bound on the number of outliers. This can be used to adaptively adjust the number of trials N.
t is determined empirically, but in some cases it can be related to the probability that a point under the threshold is actually an inlier . As pointed out in , RANSAC can be viewed as a particular M-estimator. The objective function that RANSAC maximizes is the number of data points having absolute residuals smaller that a predefined value t. This may be seen a minimising a binary loss function that is zero for small (absolute) residuals, and 1 for large absolute residuals, with a discontinuity at t.
By virtue of the prespecified inlier band, RANSAC can fit a model to data corrupted by substantially more than half outliers. It can tolerate up to 50% of outliers, as up to half of the data point can be arbitrarily far from the “true” estimate without changing the objective function value. Since the median is not differentiable, a random sampling strategy similar to RANSAC is adopted. Instead of using the consensus, each sample of size p is scored by the median of the residuals of all the data points. The model with the least median (lowest score) is chosen. A final weighted least-squares fitting is used. With respect to RANSAC, LMedS can tolerate “only” 50% of outliers, but requires no setting of thresholds. Camera calibration (or resection) as described so far, requires a calibration object that consists typically of two or three planes orthogonal to each other. This might be difficult to obtain, without access to a machine tool. Zhang  introduced a calibration technique that requires the camera to observe a planar pattern (much easier to obtain) at a few (at least three) different orientation. Either the camera or the planar pattern can be moved by hand. Instead of requiring one image of many planes, this method requires many images of one plane. We will also introduce here a more realistic camera model that takes into account non-linear effects produced by lenses. In each view, we assume that correspondences between image points and 3D points on the planar pattern have been established. Figure 18: Image of a planar calibration pattern. The points used for calibration are the corners of the black squares. where ri are the column of R.
Suppose that H is computed from correspondences bwtween four or more known world points and their images, then some constraints can be obtained on the intrinsic parameters, thanks to the fact that the columns of R are orthonormal. where is an unknown scale factor. A single view of the plane gives two equations in six unknowns, hence a solution is achievable with n > 3 views (in practice, for a good calibration, one should use around 12 views). Because of noise, the matrix R is not guaranteed to be orthogonal, hence we need to recover the closest orthogonal matrix. Let R = QS be the polar decomposition of R. Then Q is the closest possible orthogonal matrix to R in Frobenius norm. In this way we have obtained the camera matrix P by minimizing an algebraic distance which is not geometrically meaningful. where i = [ i| i] and the rotation has to be suitably parameterized with three parameters (see Rodrigues formula). The linear solution is used as a starting point for the iterative minimization (e.g. Gauss-Newton). A realistic model for a photocamera or a videocamera must take into account non-linear distortions introduced by the lenses, especially when dealing with short focal lengths or low cost devices (e.g. webcams, disposable cameras). where rd2 = 2 + 2 and (u 0,v0) are the coordinates of the image centre. Estimating k1 Let us assume that the pinhole model is calibrated. The point m = (u,v) projected according to the pinhole model (undistorted) do not coincide with the measured points = (û, ) because of the radial distortion. hence a least squares solution for k1 is readily obtained from n > 1 points. When calibrating a camera we are required to simultaneously estimate both the pinhole model’s parameters and the radial distortion coefficient. The pinhole calibration we have described so far assumed no radial distortion, and the radial distortion calibration assumed a calibrated pinhole camera. The solution (a very common one in similar cases) is to alternate between the two estimation until convergence. Namely: start assuming k = 0, calibrate the pinhole model, then use that model to compute radial distortion. Once k1 is estimated, refine the pinhole model by solving Eq. (130) with the radial distorion in the projection, and continue until the image error is small enough. Given a pair of stereo images, epipolar rectification (or simply rectification) determines a transformation of each image plane such that pairs of conjugate epipolar lines become collinear and parallel to one of the image axes (usually the horizontal one). The rectified images can be thought of as acquired by two new virtual cameras, obtained by rotating the actual cameras and possibly modifying the intrinsic parameters. The important advantage of rectification is that computing stereo correspondences is made simpler, because search is done along the horizontal lines of the rectified images. We assume here that the stereo pair is calibrated, i.e., the cameras’ internal parameters, mutual position and orientation are known. This assumption is not strictly necessary [16, 30, 23], but leads to a simpler technique and less distorted images. Specifying virtual cameras. Given the actual camera matrices Por and Po , the idea behind rectification is to define two new virtual cameras Pnr and Pn obtained by rotating the actual ones around their optical centers until focal planes becomes coplanar, thereby containing the baseline (Figure 19). This ensures that epipoles are at infinity, hence epipolar lines are parallel. To have horizontal epipolar lines, the baseline must be parallel to the x-axis of both virtual cameras. In addition, to have a proper rectification, conjugate points must have the same vertical coordinate. In summary: positions (i.e, optical centers) of the virtual cameras are the same as the actual cameras, whereas the orientation of both virtual cameras differs from the actual ones by suitable rotations; intrinsic parameters are the same for both cameras. Therefore, the two resulting virtual cameras will differ only in their optical centers, and they can be thought as a single camera translated along the x-axis of its reference system. Figure 19: Epipolar geometry before and after rectification. that are the x, y, and z-axes, respectively, of the virtual camera reference frame, expressed in world coordinates. In point 2, k fixes the position of the y-axis in the plane orthogonal to x. In order to ensure that the virtual cameras look in the same direction as the actual ones, k is set equal to the direction of the optical axis of one of the two actual cameras. We assumed that both virtual cameras have the same intrinsic parameters. Actually, the horizontal components of the image centre (v0) can be different, and this degree of freedom might be exploited to “center” the rectified images in the viewport by applying a suitable horizontal translation. The rectifying transformation. In order to rectify, say, the left image, we need to compute the transformation mapping the image plane of Po onto the image plane of Pn . The transformation sought is a linear transformation of the projective plane (a collineation) given by the 3 � 3 matrix H = P3�3,n P3�3,o -1. Note that the scale factor can be neglected, as the transformation H is defined up to a scale factor (being homogeneous). The same result applies to the right image. It is useful to think of an image as the intersection of the image plane with the cone of rays between points in 3D space and the optical centre. We are moving the image plane while leaving fixed the cone of rays. 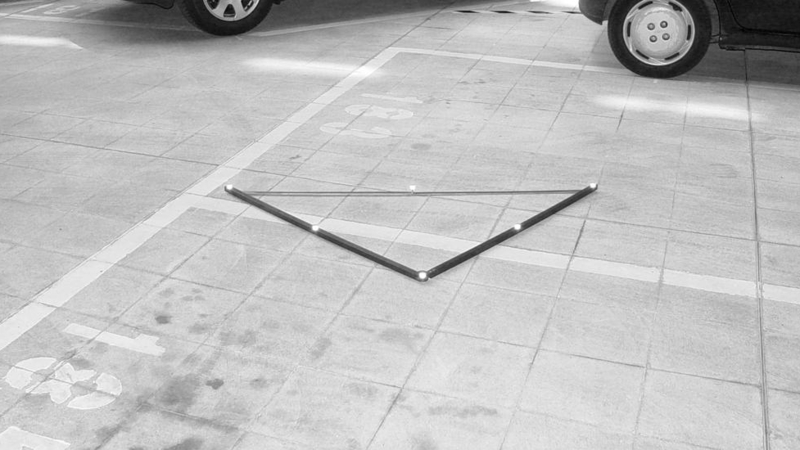 Reconstruction of 3D points by triangulation can be performed from the rectified images directly, using Pnr and Pn . More details on the rectification algorithm can be found in , from which this section has been adapted. Figure 20: Original and rectified stereo pair. General books on (Geometric) Computer Vision are: [4, 51, 6, 12]. Acknowledgements The backbone of this tutorial has been adapted from . Many ideas are taken from . Most of the material comes from multiple sources, but some sections are based on one or two works. In particular: the section on rectification is adapted from ; Sec. 5.4 is based on . Michela Farenzena, Spela Ivekovic, Alessandro Negrente, Sara Ceglie and Roberto Marzotto produced most of the pictures. Some of them were inspired by . S. Avidan and A. Shashua. Novel view synthesis in tensor space. In Proceedings of the IEEE Conference on Computer Vision and Pattern Recognition, pages 1034-1040, 1997. P. Beardsley, A. Zisserman, and D. Murray. Sequential update of projective and affine structure from motion. International Journal of Computer Vision, 23(3):235-259, 1997. B. S. Boufama. The use of homographies for view synthesis. In Proceedings of the International Conference on Pattern Recognition, pages 563-566, 2000. O. Faugeras. 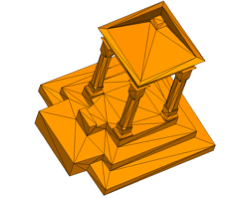 Three-Dimensional Computer Vision: A Geometric Viewpoint. The MIT Press, Cambridge, MA, 1993. O. Faugeras. Stratification of 3-D vision: projective, affine, and metric representations. Journal of the Optical Society of America A, 12(3):465-484, 1994. O. Faugeras and Q-T Luong. The geometry of multiple images. MIT Press, 2001. O. D. Faugeras and L. Robert. What can two images tell us about a third one? In Proceedings of the European Conference on Computer Vision, pages 485-492, Stockholm, 1994. A. Fusiello. Uncalibrated Euclidean reconstruction: A review. Image and Vision Computing, 18(6-7):555-563, May 2000. A. Fusiello, A. Benedetti, M. Farenzena, and A. Busti. Globally convergent autocalibration using interval analysis. IEEE Transactions on Pattern Analysis and Machine Intelligence, 26(12):1633-1638, December 2004. A. Fusiello, E. Trucco, and A. Verri. A compact algorithm for rectification of stereo pairs. Machine Vision and Applications, 12(1):16-22, 2000. R. Hartley, E. Hayman, L. de Agapito, and I. Reid. Camera calibration and the search for infinity. In Proceedings of the IEEE International Conference on Computer Vision, 1999. R. Hartley and A. Zisserman. Multiple view geometry in computer vision. Cambridge University Press, 2nd edition, 2003. R. I. Hartley. Estimation of relative camera position for uncalibrated cameras. In Proceedings of the European Conference on Computer Vision, pages 579-587, Santa Margherita L., 1992. R. I. Hartley. In defence of the 8-point algorithm. In Proceedings of the IEEE International Conference on Computer Vision, 1995. R. I. Hartley and P. Sturm. Triangulation. Computer Vision and Image Understanding, 68(2):146-157, November 1997. R.I. Hartley. Theory and practice of projective rectification. International Journal of Computer Vision, 35(2):1-16, November 1999. A. Heyden. Projective structure and motion from image sequences using subspace methods. In Scandinavian Conference on Image Analysis, 1997. A. Heyden. A common framework for multiple-view tensors. In Proceedings of the European Conference on Computer Vision, Freiburg, Germany,, 1998. A. Heyden. Tutorial on multiple view geometry. In conjunction with ICPR00, September 2000. A. Heyden and K. �ström. Euclidean reconstruction from constant intrinsic parameters. In Proceedings of the International Conference on Pattern Recognition, pages 339-343, Vienna, 1996. A. Heyden and K. �ström. Minimal conditions on intrinsic parameters for Euclidean reconstruction. In Proceedings of the Asian Conference on Computer Vision, Hong Kong, 1998. T.S. Huang and O.D. Faugeras. Some properties of the E matrix in two-view motion estimation. IEEE Transactions on Pattern Analysis and Machine Intelligence, 11(12):1310-1312, December 1989. F. Isgro and E. Trucco. Projective rectification without epipolar geometry. In Proceedings of the IEEE Conference on Computer Vision and Pattern Recognition, pages I:94-99, Fort Collins, CO, June 23-25 1999. F. Isgrò, E. Trucco, P. Kauff, and O. Schreer. 3-D image processing in the future of immersive media. IEEE Transactions on Circuits and Systems for Video Technology, 14(3):288-303, 2004. S. Ivekovic, A. Fusiello, and E. Trucco. Fundamentals of multiple view geometry. In O. Schreer, P. Kauff, and T. Sikora, editors, 3D Videocommunication. Algorithms, concepts and real-time systems in human centered communication, chapter 6. John Wiley & Sons, 2005. ISBN: 0-470-02271-X. K. Kanatani. Geometric Computation for Machine Vision. Oxford University Press, 1993. S. Laveau and O. Faugeras. 3-D scene representation as a collection of images and foundamental matrices. Technical Report 2205, INRIA, Institut National de Recherche en Informatique et an Automatique, February 1994. Jed Lengyel. The convergence of graphics and vision. IEEE Computer, 31(7):46-53, July 1998. D. Liebowitz and A. Zisserman. Metric rectification for perspective images of planes. In Proceedings of the IEEE Conference on Computer Vision and Pattern Recognition, pages 482-488, 1998. C. Loop and Z. Zhang. Computing rectifying homographies for stero vision. In Proceedings of the IEEE Conference on Computer Vision and Pattern Recognition, pages I:125-131, Fort Collins, CO, June 23-25 1999. Q.-T. Luong and T. Viéville. Canonical representations for the geometries of multiple projective views. Computer Vision and Image Understanding, 64(2):193-229, 1996. Yi Ma, Stefano Soatto, Jana Kosecka, and Shankar S. Sastry. An Invitation to 3-D Vision. Springer, November 2003. J. R. Magnus and H. Neudecker. ”Matrix Differential Calculus with Applications in Statistics and Econometrics”. John Wiley & Sons, revised edition, 1999. S. Mahamud, M. Hebert, Y. Omori, and J. Ponce. Provably-convergent iterative methods for projective structure from motion. In Proceedings of the IEEE Conference on Computer Vision and Pattern Recognition, pages I:1018-1025, 2001. S. J. Maybank and O. Faugeras. A theory of self-calibration of a moving camera. International Journal of Computer Vision, 8(2):123-151, 1992. P. R. S. Mendonça. Multiview Geometry: Profiles and Self-Calibration. PhD thesis, University of Cambridge, Cambridge, UK, May 2001. P.R.S. Mendonça and R. Cipolla. A simple techinique for self-calibration. In Proceedings of the IEEE Conference on Computer Vision and Pattern Recognition, pages I:500-505, 1999. Thomas Minka. Old and new matrix algebra useful for statistics. MIT Media Lab note. Theo Moons. A guided tour through multiview relations. In SMILE, pages 304-346, 1998. M. Pollefeys, R. Koch, and L. Van Gool. Self-calibration and metric reconstruction in spite of varying and unknown internal camera parameters. In Proceedings of the IEEE International Conference on Computer Vision, pages 90-95, Bombay, 1998. L. Robert, C. Zeller, O. Faugeras, and M. Hébert. Applications of non-metric vision to some visually-guided robotics tasks. In Y. Aloimonos, editor, Visual Navigation: From Biological Systems to Unmanned Ground Vehicles, chapter 5, pages 89-134. Lawrence Erlbaum Associates, 1997. A. Shashua. Trilinear tensor: The fundamental construct of multiple-view geometry and its applications. In International Workshop on Algebraic Frames For The Perception Action Cycle (AFPAC), Kiel Germany, Sep. 8-9 1997. A. Shashua and N. Navab. Relative affine structure: Canonical model for 3D from 2D geometry and applications. IEEE Transactions on Pattern Analysis and Machine Intelligence, 18(9):873-883, September 1996. C. V. Stewart. Robust parameter estimaton in computer vision. SIAM Review, 41(3):513-537, 1999. P. Sturm and B. Triggs. A factorization based algorithm for multi-image projective structure and motion. In Proceedings of the European Conference on Computer Vision, pages 709-720, Cambridge, UK, 1996. R. Szeliski. Video mosaics for virtual environments. IEEE Computer Graphics and Applications, 16(2):22-30, March 1996. C. Tomasi and T. Kanade. Shape and motion from image streams under orthography - a factorization method. International Journal of Computer Vision, 9(2):137-154, November 1992. Philip H. S. Torr and Andrew Zisserman. Robust computation and parametrization of multiple view relations. In ICCV, pages 727-732, 1998. B. Triggs. Autocalibration and the absolute quadric. In Proceedings of the IEEE Conference on Computer Vision and Pattern Recognition, pages 609-614, Puerto Rico, 1997. Bill Triggs, Philip F. McLauchlan, Richard I. Hartley, and Andrew W. Fitzgibbon. Bundle adjustment - a modern synthesis. In Proceedings of the International Workshop on Vision Algorithms, pages 298-372. Springer-Verlag, 2000. E. Trucco and A. Verri. Introductory Techniques for 3-D Computer Vision. Prentice-Hall, 1998. Cha Zhang and Tsuhan Chen. A survey on image-based rendering - representation, sampling and compression. Technical Report AMP 03-03, Electrical and Computer Engineering - Carnegie Mellon University, Pittsburgh, PA 15213, June 2003. Z. Zhang. Determining the epipolar geometry and its uncertainty: A review. International Journal of Computer Vision, 27(2):161-195, March/April 1998. A. Zisserman. Single view and two-view geometry. Handout, EPSRC Summer School on Computer Vision, 1998. available from http://www.dai.ed.ac.uk/CVonline/LOCAL_COPIES/EPSRC_SSAZ/epsrc_ssaz.html.